Seniors across Harvard’s soccer program will be celebrated this weekend when the men’s and women’s sides both play Columbia in their last games at Jordan Field this season. The women’s team will play at 1 p.m. on Saturday while the men’s team will play at 7 p.m. later that day. The men’s team (3-11, 1-4 Ivy) looks to close out its season on a high note. Having lost its last six games, a span in which it has been outscored 12-2, the Crimson will need to improve its offense. Playing at Jordan Field this weekend could reignite its scoring attack as all the team’s victories this season have come at home. Harvard has a winning record in Cambridge with victories against competitive teams such as Providence (9-6-2) and Yale (6-5-3). Getting top scorers involved in the offense from the beginning of the game will be integral to a Crimson win this Saturday. Freshman Alfred Perez leads the team in scoring with three goals and has been a crucial part of the offense during Harvard’s victories. He was able to score the lone goal in the Crimson’s 1-0 win over the Bulldogs. Another key factor in this upset bid will be Harvard’s distribution of the ball. The Crimson has only had eight assists this season and only one assist during conference play. The ball will have to move around more in order to combat the Lions defense, which has only let up 10 goals this season. Columbia (9-4-1, 4-1) has won its last four games and has momentum coming off a 4-0 thrashing of Hofstra this past Tuesday. Having been a consistently strong team in recent history, a victory this Saturday will make it four straight seasons with at least 10 wins for the Lions. Stopping Columbia’s potent attack will be critical if Harvard wants to prevent its seventh consecutive loss. The Lions have scored 22 goals and 19 assists this season and are averaging 12.3 shots per game. Keeping their top scorers, Dylan Mott and Kynan Rocks, in check, will be a decisive factor in this game. With a more fluid offensive game plan and stout defense, Harvard has the potential to give its seniors a spectacular senior night that ends with an upset victory. A win against Columbia puts the Crimson in great position to beat Penn in its last game of the season. The women’s team also looks to give its seniors a farewell treat. The Crimson (6-7-1, 3-2-1) can finish as high as second in the Ivy League with a win over the Lions. In order to come out of Saturday with a win, Harvard will have to continue to glean valuable contributions from both its veterans and its underclassmen. Senior Leah Mohammadi leads the team with seven goals and 16 points and has been able to perform under pressure during the team’s tight games. 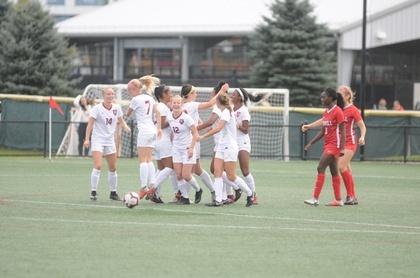 In the Crimson’s 3-2 thriller comeback victory over Brown, the California native showed her poise and experience with a goal and an assist in the second half. In the last two seasons, this game has gone to extra minutes, with last year’s match ending in a scoreless draw. Mohammadi’s veteran leadership will be of utmost importance during these types of clutch circumstances. Freshmen Sophie Hirst and Taylor Nielsen have also been key offensive contributors for the Crimson with three goals apiece this season. Hirst has already been selected as Ivy League Player of the Week in her young career. In what looks to be a competitive game, having these underclassmen at their best will be critical to a Crimson victory. The Lions (8-6-1, 4-2) are fresh off back-to-back Ivy League victories and are looking to continue their momentum in Cambridge as they are also looking to secure the second place spot in the Ancient Eight. Considering they only need a draw to finish second, look for Columbia to try to score early and play a defensive game. The Harvard offense needs to attack aggressively so that the Lions cannot simply play keep away the entire game. Furthermore, the Crimson defense will have to step up to stifle the slew of weapons Columbia has on the offensive weapons, as the Lions have had ten players who have scored this season. Harvard’s women’s side will certainly contend with a hard-fought game this weekend, but with the talent the team has at its disposal, the Crimson can bring home a second-place finish in the Ivy League in what will be the seniors’ final game of their careers.